The 1980’s. A decade of flamboyant style and bizarre fashion. Everyone wanted to be a part of this impressive fashion show. Everyone could dress the part, but it took real pioneers to wake up every morning and look in the mirror, knowing they donned the latest hairstyle. As usual, television and music played a significant role in the trendiest fashions that the cool kids were wearing. 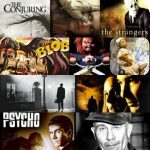 I have created a list of the top ten most famous 1980’s hairstyles. When the Thriller album reached store shelves, every man on the planet wanted to be Michael Jackson. Men everywhere started to emulate Jackson by attempting the favorite hairstyle known as the Jheri Curl. The Jheri Curl was tough to maintain but with the creation of the Jheri Curl do it yourself kit, it became achievable. While the Jheri Curl was more accessible than it was in the past, it was still a lot of maintenance and chemical use to achieve that shiny look. Men wanted that big-haired look without all the maintenance, this was the introduction to the High Top Fade. 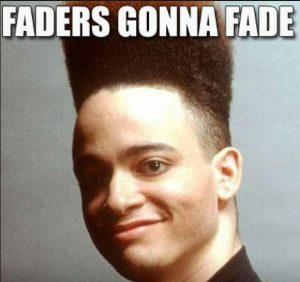 The High Top Fade is a cross between a regular flattop, in which the hair on the side and back were cut off or shaved while the hair on top of the head was allowed to grow out. This hairstyle was trendy among black males and was worn by such actors as Kid N’ Play and Will Smith on Fresh Prince of Bel-Air. You may remember a young and beautiful Queen Latifah rocking this trend also. All hail the scrunchie!! These handy little inventions were created sometime during the 1980’s, and if you were a girl during that time, you had a scrunchie to match every shirt you owned. Most girls during this time wore their scrunched ponytails high atop their head, the higher, the better. There was an incredible amount of teasing, and Aqua Net involved as well. You may remember these cute ponytails on shows like Full House where D.J. Tanner rocked the side high scrunchie pony. 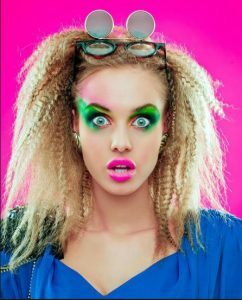 If you were a teen girl in the 80’s, you owned a crimping iron. Hair crimping is a style that consists of pressing long, straight hair into a sawtoothed crimping iron to make crinkles or deep waves. Before the invention of the crimping iron, this look was achieved by braiding wet hair and letting it sit for a few hours and then taking the braids out. Thanks to such beauties like Farrah Faucett, the feathered hairstyle was a very sought outlook in the 1980’s. Girls and guys everywhere were struggling to perfect those feathered wings on the sides of their heads. Feathered hair was designed for straight or wavy hair. The hair was layered with either a center or side part. After you had the perfect cut, the hair would be brushed back on the sides resembling a bird’s feathered wings. This hairstyle gained phenomenal popularity in the early 1980’s. Many celebrities wore this style at some time or another including Rob Lowe, Princess Diana, Heather Locklear, and Michelle Pfeiffer. This hairstyle was a favorite of women of all ages. Women often get sick of the simple ponytail look. That’s where the whale spout was invented. This big hair look is a party on the top. 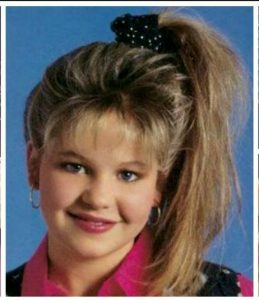 The whale spout involves tying up the top portion of your hair in a scrunchie or clip and letting it flow out the top like a fountain. In typical 80’s style, the bigger, the better was the motto with this hairstyle as well. The whale spout could be worn with bangs or without and of course it was always totally rad! 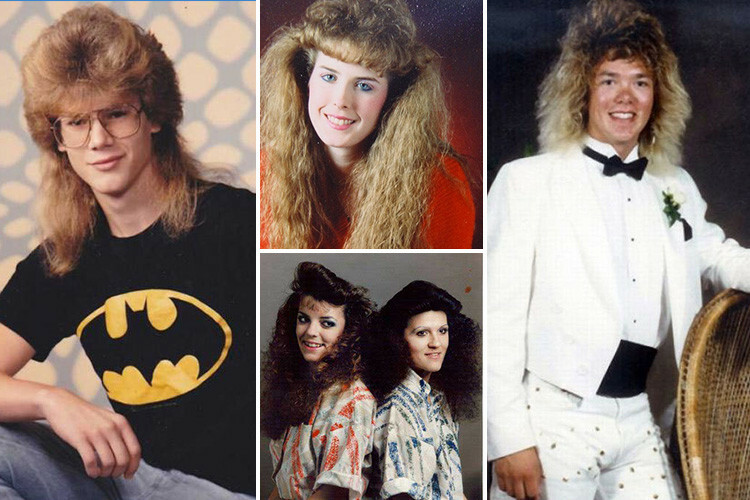 The permanent, or “perm” as it is colloquially known achieved its peak of popularity in the 80’s due to the bigger, the better mantra of the 80’s. Getting a perm involved dousing your hair with harmful chemicals, rolling it up and sitting under a machine for an hour while it worked its magic. There were several types of perms in the 1980’s that were popular, but the spiral perm won over the masses. 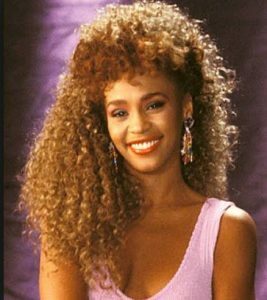 Almost every celebrity has rocked a perm at one time or another, but the most memorable perms were rocked by Jennifer Grey, Whitney Houston, Barbra Streisand, and Sarah Jessica Parker. One of the most outrageous hairstyles of the 80’s, the Mohawk or Mohican as it was also known, was one nobody would ever forget. 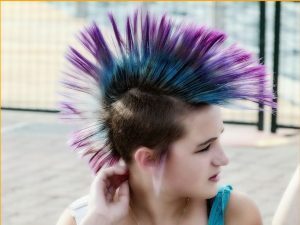 This edgy hairdo is where both sides of the head are shaved, and a thin strip in the center is spiked and sometimes dyed. The mohawk is also commonly referred to as an “iro” in reference to the Iroquois, from whom the hairstyle is derived, though historically the hair was plucked out rather than shaved. Mohawks or mohawk-like hairstyles can be cut in patterns deviating from the simple central strip. For example, a mohawk with multiple parallel strips of hair may be called a “bi-hawk” (for two strips), a “tri-hawk” (for three strips), etc. No matter how it was done, nobody would ever forget this style. This fad is very self-explanatory and quite possibly one of the fashion statements we would all gladly forget about. Most research indicates that the male ponytail inspired the rat tail. You could do a lot with a rat tail that you couldn’t do with a ponytail. A lot of celebrities also sported the tail of the rat. 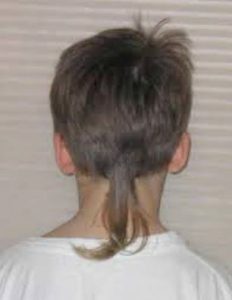 Most wore artificial rat tails which drastically improved the sales of fake tails. This hairstyle was all about the volume! Bigger is better when it comes to bangs in the 80’s. This trend was popular on men and women. 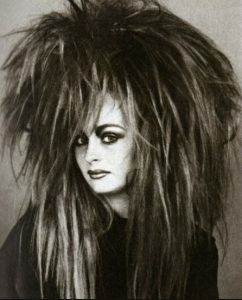 Most people believe that this trend started because celebrities had big hair. Most soap operas were filled with women that had big hair. I’m talking real soap operas like Dallas and Falcon Crest. But the big hair wasn’t just making waves on the television set. Big hair was also very popular on the music scene. All you had to do to achieve this high hair was to let it grow out and tease it. There was also a lot of hairsprays and copious amounts of mousse involved. You were ready for a night on the town when your hair could survive a Category 4 hurricane. We’ve reached our number one spot. The mullet. Business in the front and a party in the back. Every man in the 80’s had one of these at some point. A lot of women even had them. You could have this hairstyle no matter what type of hair you had, as long as you kept the back long and the top short. 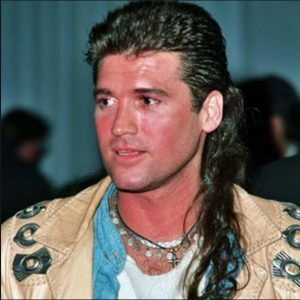 The list of celebrities that rocked the mullet is too long to add everyone, but some of our favorites were David Bowie, Rod Stewart, Paul Mccartney, and Billy Ray Cyrus. We hope you’ve enjoyed this trip down memory lane and we’d love to hear about your 80’s hairy-tales!! Previous Post: « Spooktacular Halloween Cocktails! !